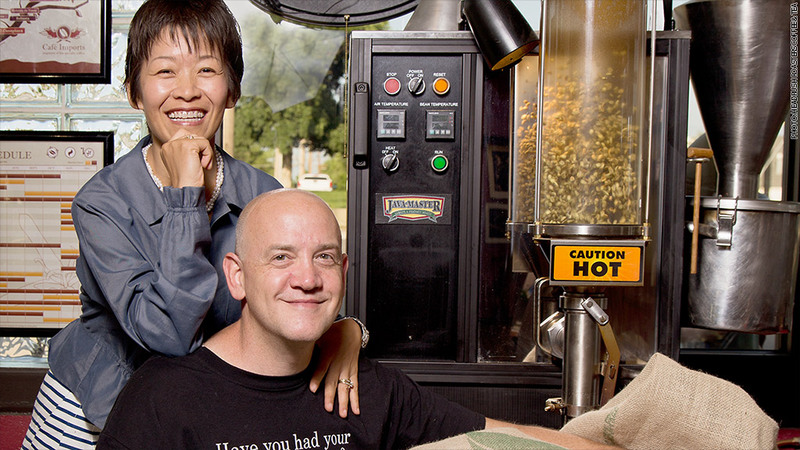 Eric Schneider emptied his 401(k) to start a specialty coffee and tea shop with his wife Nancy in 2012. Two years later, the business is set to log a profit. If you're saving for retirement, one of the cardinal rules is: "Don't touch your 401(k) until you retire." Eric Schneider followed it diligently during his 25 years selling commercial insurance. But two years ago, he emptied his nest egg to launch Headrush Roasters Coffee & Tea in Kansas City, Mo. "I took a big risk, but I don't regret it at all," said Schneider, 49, who co-owns the business with his wife Nancy. Schneider left his six-figure job in 2010 with $250,000 in his 401(k) and $100,000 in savings. In 2011, he found a vacant building that he thought would be perfect for his coffee shop and roastery. He hoped to lease it, but the owner only wanted to sell. "I'm a big believer in no debt," he said. "I had paid off my house, my cars. I didn't want to take out a loan to buy the building." As he researched financing options, he came across ROBS, or Rollovers as Business Startups. These allow people to use the money in their 401(k) to start a business (or buy an existing one) without paying taxes on the withdrawn funds or getting hit with an early withdrawal penalty. The process can be pretty complicated, however. First, you must incorporate a business and open a new 401(k) plan under it. Then you roll your existing 401(k) funds into the new plan. Since both accounts are tax-exempt, you avoid taking the tax hit. As owner of the new company, you can now direct what the 401(k) invests in. With ROBS, the new company typically issues shares that you can purchase using money from the 401(k). You're then free to use the cash from that purchase for operational expenses (although owners must pay their own salaries out of revenue, not from the 401(k) funds). While the IRS does not consider ROBS an "abusive tax-avoidance transaction," the agency calls the arrangement "questionable" and has strict compliance standards to avoid penalties (and audits). Because the process was so involved, Schneider signed up with Bellevue, Wash.-based Guidant Financial, which is among a handful of financing firms that help entrepreneurs set up ROBS. Guidant began offering ROBS in 2004, and it has become the firm's signature product. Cofounder David Nilssen said his firm has had 9,000 entrepreneurs take advantage of the financing option, and 80% of them are still in business after four years. "This option isn't for everyone," said Nilssen. "There's a niche market for it, and individuals who've accumulated enough assets in life are more open to it." He said their ROBS clients are typically between 40 and 60 years old, own their own homes and have advanced degrees with a combined household income of over $75,000. "60% of them are first-time entrepreneurs who are choosing a second career," he said. Still, Stuart Ritter, senior financial planner and vice president with T. Rowe Price, said ROBS can be risky. "With ROBS, you're putting 100% of your retirement saving into a single security," he said. "People really have to think about this." It can also be difficult for entrepreneurs to rebuild their nest egg. Chrissy and Mike Mayhew opened Beach House Miracles, a renovation firm, in Ocean View, Del., in 2008. They didn't have capital so they funded the startup using $100,000 from their 401(k). Today, they have five employees and logged $1 million in revenue last year. But even though the business has been successful, they have yet to start contributing to their retirement plan. Still, they're comfortable with their decision. "The gamble paid off for us," Chrissy said. Do you have what it takes to be rich? Meanwhile, Schneider was able to buy the building with the $250,000 from his 401(k). He spent his $100,000 in savings on remodeling and equipment and opened Headrush in 2012. If he ever sells the business, he'll put the money back into the 401(k) plan. If the business fails, he won't have to pay a penalty but he also won't have his retirement cushion. So far, things are going well. After two years in business, the company is set to log a profit this year. It has seven employees and is looking to open more locations. "It's been a win-win for me, the government and the economy," Schneider said. "I've created a business, the government is collecting taxes on my business and I'm hiring people."